Journalism Design is about the future of journalism. As technologies increasingly, and continually, reshape the way we interact with information, with each other and with our environment, journalists need new ways to tell stories. Journalists often see technology as something that improves what they are doing or that makes it more convenient. However, the growing might of technology companies has put journalism and news organisations in a difficult position: readers and revenues have moved, and platforms exert increasing control over story design. Skye Doherty argues that, rather than adapting journalism to new technologies, journalists should be creating the technologies themselves and those technologies should be designed for core values such as the public interest. 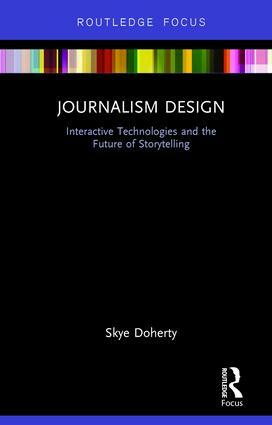 Drawing from theories and practices of interaction design, this book demonstrates how journalists can use their expertise to imagine new ways of doing journalism. The design and development of the NewsCube, a three-dimensional storytelling tool, is detailed, as well as how interaction design can be used to imagine new forms of journalism. The book concludes by calling for closer ties between researchers and working journalists and suggests that journalism has a hybrid future – in newsrooms, communities, design studios and tech companies. Skye Doherty is a lecturer in Journalism at the University of Queensland’s School of Communication and Arts. Her research and teaching straddle journalism and interaction design. The Disruptions: Studies in Digital Journalism series features ground breaking short form publications which engage with cutting edge technological and critical developments and debates in contemporary digital journalism theory and practice. Titles in the series explore emerging hot topics, present detailed case studies and offer new assessments of theoretical and conceptual innovations in relation to subjects including digital journalism ethics, robot news, data journalism, web metrics and online surveillance. Titles respond quickly to the latest developments in the field and showcase the work of best new and established critical thinkers in this vibrant and emerging area.